Justórum ánimæ in manu Dei sunt, et non tanget illos torméntum mortis. Visi sunt óculis insipiéntium mori: illi autem sunt in pace. There has been a brief discussion on social media about whether we should call Fr. Hamel a martyr; whether he died in odium fidei. I don't think there is any room for doubt on that score: what other reason could make two men walk into a small church during the celebration of Mass and cut the throat of the priest (who was in his 80s and hardly likely to be any kind of physical threat to anyone)? Fr. 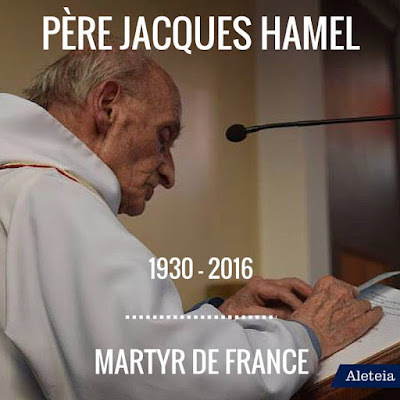 Jacques Hamel, ora pro nobis.